The Mora of Sweden Morakniv Companion is an all-in-one fixed blade knife for outdoor enthusiasts. 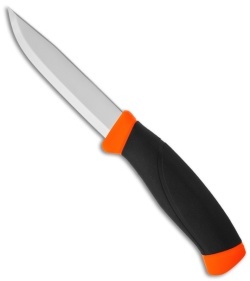 The Companion features Swedish cold-rolled special stainless steel blade, a taper grind, and comes razor sharp. 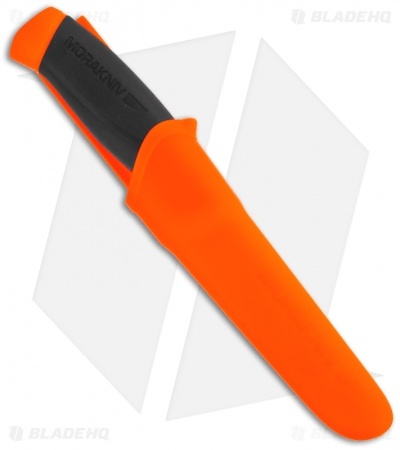 The handle features high-friction grip no-slip black and orange rubber handle. Comes with orange plastic sheath with a belt clip. This is a great outdoor knife or fishing knife. It is really durable and can be beaten on with no problems. The edge is great and can be resharpened easily. The Orange makes it good for outdoor activities, so you can find it easily. The stainless steel is low manintance, and I have never had a rust problem. The sheath did break on me so I ordered a kydex sheat. This knife is amazing for the price.